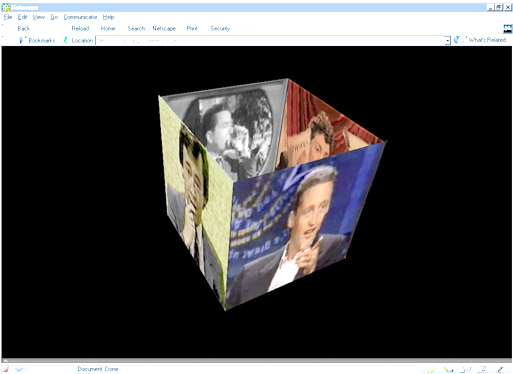 TVSpace – 1998 | JONAH BRUCKER-COHEN, PH.D. TVSpace – 1998 – JONAH BRUCKER-COHEN, PH.D.
TVSpace was a web-based television client where live television stations were mapped to a rotating 3D Cube. To change channels, one would use a typical television remote control and press the “Channel Up” button which would then rotate the cube to show the station that was a selected. The project was built using VRML, custom electronics including a Basic Stamp that read in infrared values from a television remote control and activated a script to flip the cube in 3D. The software ran within a browser.